Mountain permafrost in Central Asia occupies approximately 3.5 million square kilometers and makes up about 15 per cent of the total permafrost area in the Northern Hemisphere. The climatic variations during the 20th century and especially during the last two decades have impacted current permafrost temperatures. 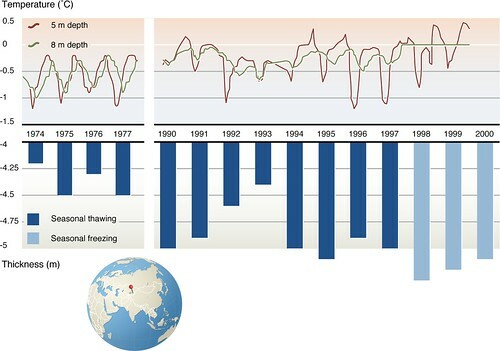 In the Tien Shan Mountains, Qinghai-Tibet Plateau, and western Mongolian sector of the Altai Mountains, observations over the last 30 years show that permafrost warmed by 0.3°C in undisturbed systems and by up to 0.6°C in areas affected by human activities. In the northern Tien Shan Mountains and the Mongolian Altai Mountains, the average active-layer thickness increased by 20–25 per cent in comparison with the early 1970s. The figure displays data for 1974–1977 and 1990–2004 measured in a borehole at the 'Cosmostation' permafrost observatory, 3300 m above sea level, Northern Tien Shan Mountains in Central Asia.